The Stryker brigade combat team (SBCT) is a full-spectrum combat force that provides division, corps, or joint task force commanders a unique capability across the spectrum of conflict. The SBCT balances lethality, mobility, and survivability against the requirements for rapid strategic deployability. The SBCT's cavalry squadron (reconnaissance, surveillance, and target acquisition [RSTA]); robust intelligence, surveillance, and reconnaissance (ISR) integration capability; and combined arms infantry battalions ensure its versatility across the full range of operations (offense, defense, stability, and support). This chapter highlights the capabilities and limitations of the SBCT, discusses likely scenarios in which the SBCT may be employed, and provides an overview of the SBCT's organizational structure. Combined arms assault in the close fight. Enhanced common operational picture (COP). Joint, multinational, or interagency operability. The SBCT achieves decisive action with combined arms at the infantry company level by applying the effects of direct fires from the mobile gun system (MGS), indirect fires from mortars and artillery, and joint effects of other services to support the infantry assault. The SBCT possesses a substantial capability, through its infantry and reconnaissance, surveillance, and target acquisition units, to place units and soldiers in positions of advantage throughout the area of operations. Strategically, the SBCT is capable of rapid deployment by air into any theater of operations. Operationally, the SBCT is capable of intra-theater deployment by ground, by sea, or by air transport. Tactically, the SBCT has versatile mobility with the Stryker vehicle that combines the best capabilities of mechanized and light infantry organizations. (Refer to Appendix B, Assured Mobility, for further information on SBCT mobility.) The Stryker allows the SBCT to maintain mobility through complex, close urban terrain, and it allows for a rapid repositioning capability that light infantry forces lack. The Stryker enhances tactical mobility and allows the SBCT to strike the enemy in depth, reposition its reserve rapidly, secure lines of communications, and conduct nonlinear company and battalion fights and essential RSTA operations in noncontiguous areas of operation. While the Stryker enhances the SBCT's mobility, subordinate units are not tethered to the vehicles. Reach is the ability of a deployed military force to rapidly access information, conduct collaborative information-sharing with, and receive support from, other units deployed in-theater but not in the chain of command and from out of theater assets unconstrained by geographic proximity, echelon, or command relationship. The SBCT's capability for reach enhances its force effectiveness by allowing the SBCT commander and staff to exploit a multitude of non-organic resources to accomplish assigned missions. a. The SBCT executes reach on a routine, deliberate basis as a combat power and sustainment multiplier in five primary areas: fires and effects; intelligence and information; planning and analysis; force protection; and sustainment. In addition to enhancing the SBCT's ability to accomplish its assigned mission, reach also enhances its operational agility. Reach is executed primarily through the Army force (ARFOR), although the ARFOR may authorize direct linkages between the SBCT and resource providers when it is prudent and efficient to do so. Staffs must understand the capabilities available through reach and how best to employ them for mission success. b. Reach allows the supporting headquarters to provide detailed analytical support to the SBCT commander and staff. This support includes anticipating and initiating collection against long lead-time requirements, synthesizing available information on the area of operation (AO), orchestrating the collection efforts of existing intelligence organizations, and sophisticated computer analysis of a course of action (COA) to help speed the military decision-making process (MDMP). The degree of support needed depends on the factors of mission, enemy, terrain and weather, troops and support available, time available, and civil considerations (METT-TC) and should be tailored, as the operation develops, to ensure seamless intelligence support. The SBCT employs a multi-level, integrated suite of intelligence, reconnaissance, and surveillance assets to develop and share a common operational picture throughout the force. 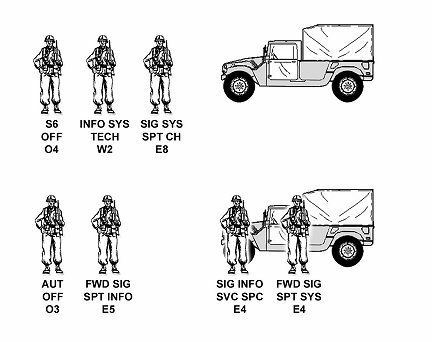 These information systems (INFOSYS) provide the SBCT commander with a unique capability to visualize, describe, and direct the brigade through the full spectrum of operations and terrain in which the unit may be operating. a. The COP is an operational picture tailored to the SBCT commander's requirements for information of friendly forces, enemy forces, and the terrain. It is based on common data and information shared with subordinate (or adjacent) commands. 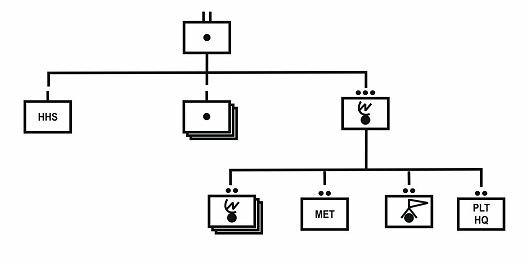 Analysis of the COP together with a commander's application of his experience, expertise, intuition, and judgment establishes a relationship among the factors of METT-TC that leads to situational understanding. Situational understanding facilitates decision-making by identifying opportunities for mission accomplishment, threats to the force and mission accomplishment, and gaps in information. Although critical information may be available via national and theater reach assets, the cavalry squadron (RSTA) (organic to the SBCT) is the primary force for providing data and combat information to build the knowledge base necessary for the SBCT to achieve situational understanding. Organic human intelligence (HUMINT) assets provide in-depth understanding of the local and regional nonmilitary (civil considerations) factors that typically influence the outcome of operations within a smaller-scale contingency. b. Due to its extensive reach capabilities, the SBCT's ISR analytical and management assets have access to intelligence and analysis from sources above the SBCT in addition to its organic HUMINT collectors and unmanned aerial vehicles (UAVs). Situational understanding enables the force to avoid surprise, make rapid decisions, control the time and place to engage in combat, shape the battlespace with fires and effects, and achieve decisive outcomes. The SBCT is equipped with the Army battle command system (ABCS) family of systems in order to carry out effective information management and achieve the quality of information sharing needed for effective planning, preparation, and execution of assigned missions. The SBCT's lethality is derived from its ability to focus overmatching combined arms support to the infantry assault at identified decisive points. Its array of direct and indirect fire systems allows the SBCT to shape the AO and achieve decisive outcomes using the MGS; tube-launched, optically tracked wire-guided (TOW) IIA/B antiarmor missiles; Javelin antiarmor missiles; 120-mm, 81-mm, and 60-mm mortars; and 155-mm artillery. Direct fire systems focus on destroying hardened and or fortified positions in support of infantry assaults. Battalion-, squadron-, and company-level organic mortars enhance timely and effective indirect fire engagements by providing immediate support and the ability to maximize the effects of high-angle fires. The antiarmor capability (antitank company and Javelin missiles) within the SBCT mitigates the presence of enemy armored forces within the area of operations. Force protection encompasses those actions taken to prevent or mitigate hostile actions against personnel, resources, facilities, and critical information. These actions conserve the SBCT's fighting potential so it can be applied at the decisive time and place and incorporate the coordinated and synchronized offensive and defensive measures to enable the effective employment of the force while degrading opportunities for the enemy. The SBCT meets force protection challenges through the application of a variety of capabilities including mobility, enhanced situational understanding, and tactical deception. The SBCT achieves force effectiveness by exploiting the abilities of its skilled soldiers and capable leaders. In addition to the human dimensions, the enhanced tactical mobility afforded by the infantry carrier vehicle (ICV) and the fidelity of the COP provided by the technological advances in command, control, communications, computers, intelligence, surveillance, and reconnaissance, allow the SBCT commander to see the friendly, see the enemy, see the terrain, conduct rapid effective decision-making, and bring effects and or forces to bear at identified decisive points. Although the SBCT is expected to always operate under ARFOR command, the SSC environment may require it to maintain direct links with multinational forces and US and foreign governmental and non-governmental organizations involved in the conflict, crisis, or instability. In many situations, the SBCT will benefit from exploiting the knowledge and capabilities residing within these organizations. Effective interaction is especially important in an environment where the adversary is primarily employing unconventional capabilities rather than conventional military power to achieve an end. In some circumstances, the SBCT headquarters or subordinate elements actively participate in civil-military activities and may operate subordinate to civil-military organizations. Interoperability with these organizations is essential and is best facilitated through the exchange of a liaison officer (LNO). 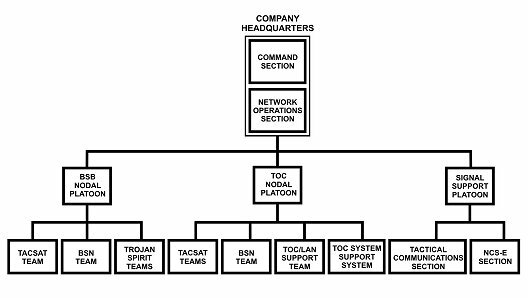 The fact that the SBCT's communications systems may not be compatible with the civil-military organization increases the need for an exchange of knowledgeable LNOs properly equipped to communicate in accordance with (IAW) the table of organization and equipment (TOE). The SBCT is primarily manned and equipped to conduct operations in an SSC. However, conditions may develop that require added capabilities not resident within the SBCT. When the SBCT participates in an MTW, it will do so as a subordinate element of a division or corps. Its mobility and organic ISR assets make it invaluable to a division or corps commander in an MTW. As with any brigade, adjustments to task organization may be required. Likely additions to the SBCT task organization may include aviation, armor, engineers, and air defense. The SBCT may be required to give portions of its cavalry squadron (RSTA) or military intelligence company (MICO) to other divisional or corps units. The SBCT's INFOSYS and organizational structure allow it to plan and execute operations simultaneously. This capability is critical to the brigade's success in SSCs and PMEs as these environments require a wide range of tasks to be executed in conjunction with one another. It is highly likely that during a typical SSC the brigade will have its RSTA cavalry squadron (RSTA) conducting a relief in place with a legacy force while one infantry battalion is escorting relief convoys and the other two infantry battalions are executing combat operations within an urban area. The brigade has the capability to successfully plan and execute several types of missions simultaneously. The frequency of joint contingency operations in the 1990s sharply increased the significance of the strategic responsiveness of the US military's force structure. 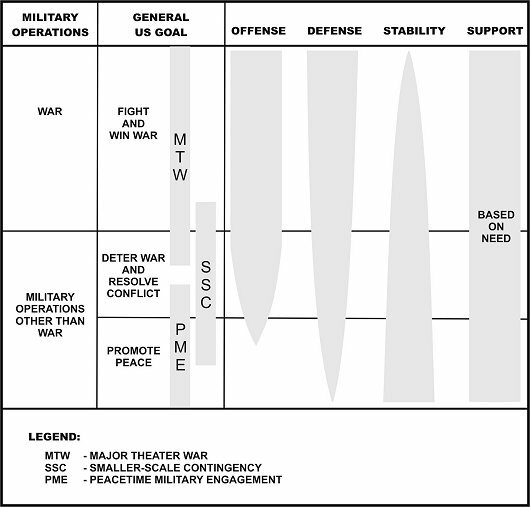 Although the Army was capable of full-spectrum dominance, it had not optimized its organization and force structure for discrete and rapid strategic response in the face of an increasingly broad range of operational demands posed by its participation in an MTW, SSC, or PME (Figure 1-1). Meeting these requirements demands a rapidly deployable, highly integrated combined arms force. This force must be able to achieve overmatching combat power against an increasingly sophisticated enemy in any terrain. The SBCT is equipped, manned, and designed to provide this capability. Figure 1-1. Full spectrum of conflict. A major theater war represents the most serious conventional military scenario that the Army may face. An MTW has the greatest potential of occurring in regions containing moderate to well-developed infrastructures (especially roads, rail, and bridges), large complex urban areas, and diverse weather patterns. With the vital interests of the nation at stake, it is the one scenario that must result in victory. Although current assessments project MTW as the least likely to occur, many current regional powers could pose a substantial challenge to the United States, possibly with little warning. a. The Enemy. Enemy forces likely will be advanced industrial-age forces with some high technology niches characterized by mechanized, motorized, and light forces. These forces will be equipped with newer generation tanks and infantry fighting vehicles and will have significant numbers of antitank guided missile (ATGM) systems, man-portable air defense (MANPAD) weapons, advanced fixed and or rotary wing aviation assets, missiles, rockets, artillery, mortars, and mines. They will possess an integrated air defense system and a robust military and civilian communications capability. Additionally, they will likely possess weapons of mass destruction (WMD). These forces are capable of long term, sustained, high tempo brigade- and division-level operations. They can also conduct sustained unconventional combat operations and limited duration (limited objective) attacks. Current and predicted trends indicate that these enemy forces will acquire more sophisticated and advanced information technology. b. Full-Spectrum Operations in an MTW. 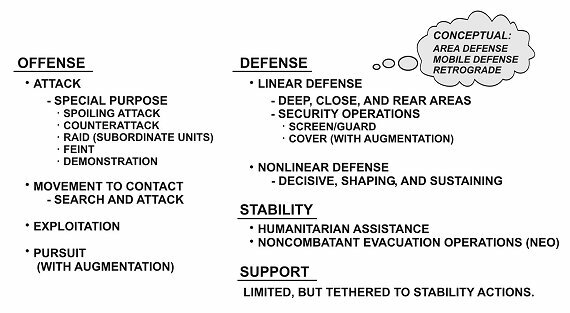 An MTW involves operations across the full range of offensive, defensive, stability, and support operations; however the operational focus is on offensive and defensive operations (Figure 1-2). 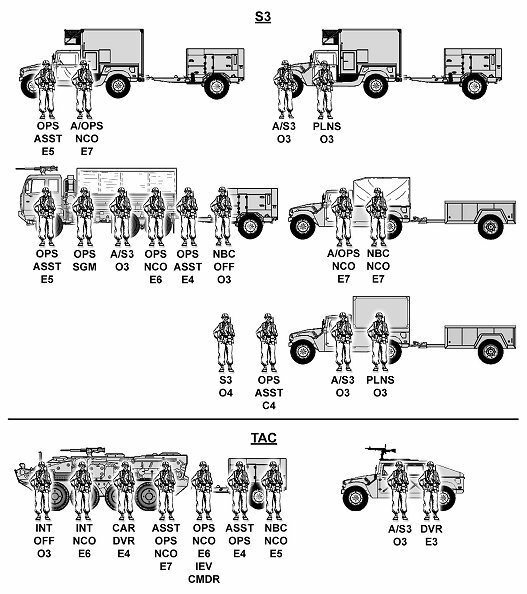 The SBCT can conduct all four types of offensive operations (attack, movement to contact, exploitation, and pursuit). The SBCT can conduct both linear and nonlinear defenses within the area defense, mobile defense, and retrograde concepts. Humanitarian issues such as overpopulation, resource shortages, natural disasters, and inadequate response capability (local, regional, or global) would probably complicate operations during an MTW. Stability operations or support operations will address these problems. Figure 1-2. Major theater war. A smaller-scale contingency is an operation, limited in terms of duration and geography, which is short of a major theater war. Left unchecked, an SSC can quickly escalate into an MTW. The physical environment of an SSC may include a range of complex and challenging features, such as very restrictive or urbanized terrain, a weak transportation and logistical infrastructure, environmental hazards, and diverse weather patterns. The political situation in the operational area may be uncertain, with varying levels of acceptance among local populations and a range of participation by coalition, interagency, and nongovernmental organizations partners. In such situations, potential adversaries may avoid open terrain in order to degrade the proven effectiveness of our target acquisition capabilities and standoff precision fires. a. The Enemy. Enemy forces in these environments will employ middle- to low-end industrial-age forces characterized by limited armored forces, mostly equipped with small numbers of early generation tanks, some mechanized forces, but predominately motorized infantry. Guerrillas, terrorists, paramilitary units, special purpose forces, special police, and local militias will be present in the environment. These forces are primarily equipped with ATGM systems, MANPAD systems, mortars, machine guns, and explosives. These forces are expected to have robust communications using conventional military devices augmented by commercial equipment such as cell phones. These forces are not capable of long term, sustained, high tempo combat operations. They are capable of conducting long term, sustained, unconventional terrorist and guerrilla operations. Current and predicted trends indicate the presence of more sophisticated and advanced information technology. b. Full-Spectrum Operations in an SSC. 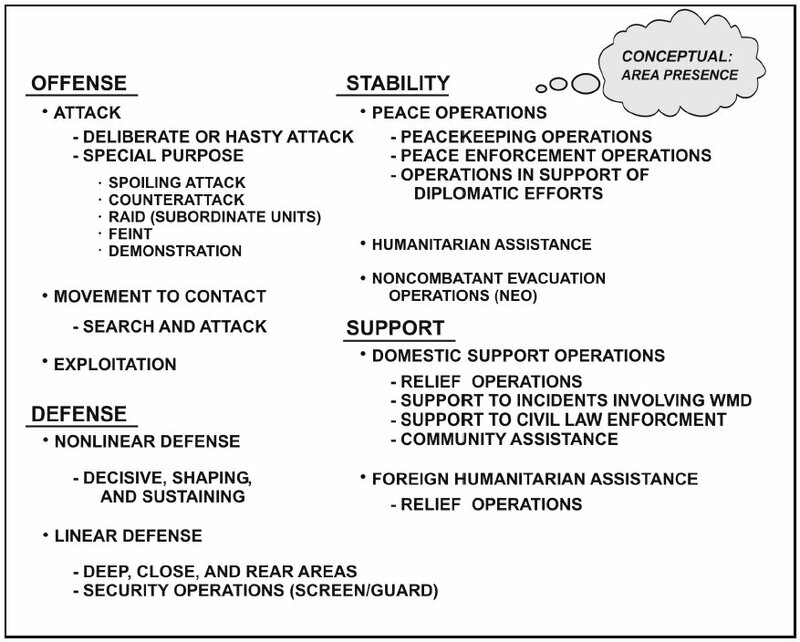 An SSC involves operations across the full range of offensive, defensive, stability, and support operations (Figure 1-3). At their most demanding, SSCs may require the simultaneous execution of offensive and defensive combat operations against the armed forces of lesser military powers (possibly not on the scale of an MTW) as well as stability operations in support of a broader mandate. The wide range of SSC operations also includes the increasing likelihood of stability actions such as peace enforcement, implementation of peace accords, evacuation of US nationals, or the provision of humanitarian relief. Given the complex nature of an SSC, it is likely that an SBCT mission may initially take the form of offensive or defensive operations with subordinate stability operations. An SBCT may eventually transition to focus on stability operations with subordinate offensive and defensive operations. As mentioned earlier, one of the brigade's significant capabilities is its ability to plan and execute simultaneous operations. A peacetime military engagement encompasses all military activities that involve other nations and is intended to shape the security environment in peacetime. PMEs include programs and exercises that the US military conducts with other nations to shape the international environment, improve mutual understanding with other countries, and improve interoperability with treaty partners or potential coalition partners. Operations in support of peacetime engagement are normally interagency in character and are designed to address the fundamental causes of instability that can lead to regional conflict. A PME further serves to demonstrate US resolve to allies and adversaries alike, conveying democratic ideals, deterring aggression, and helping to relieve sources of instability. Battlefield organization is the allocation of forces in the AO by purpose of operation, which consists of three all-encompassing categories: decisive, shaping, and sustaining. Commanders may choose to use the "decisive point," "main effort," "supporting effort" method to articulate his organization of forces if this better facilitates the commander's ability to visualize, describe, and direct actions. These purposes form the basis of the commander's concept of operations. a. Decisive Operations. Decisive operations at any echelon (accomplished by a designated main effort) directly achieve the purpose of the mission of the higher headquarters. The decisive operation conclusively determines the outcome of battles and engagements. At the SBCT level, there is only one decisive operation. However, multiple actions conducted simultaneously throughout the depth of the AO may facilitate a decisive operation. The decisive operation is normally weighted while economizing on the effort allocated to concurrent shaping operations. b. Shaping Operations. Shaping operations (or supporting efforts) establish the conditions for the success of the decisive operation. (1) When expressing his intent, the commander clearly and succinctly defines how the effects of shaping operations support the decisive operation. Shaping operations use the full range of military power to neutralize or reduce enemy capabilities and create the conditions that contribute to the success of a decisive operation. Shaping operations may occur simultaneously or in sequence with the decisive operation and may involve any combination of forces. Normally the commander economizes on the amount of force devoted to shaping operations that occur simultaneously with the decisive operation. At times, however, the commander may determine that the preponderance of military forces must be devoted to shaping operations in order to produce conditions and effects for a decisive operation to be successful. (2) If the commander determines that the force available does not permit simultaneous decisive and shaping operations, he sequences shaping operations around the decisive operation. Commanders of shaping operations designate units to accomplish their own decisive, shaping, and sustaining operations. Regardless of the type of operation, a shaping operation may become the decisive operation if circumstances or opportunity demand. Therefore, the commander weights the new decisive operation at the expense of other concurrent shaping operations. (3) Shaping operations can take many forms including support to attacks and defenses, security, actions of the reserve before commitment, and the movement of friendly forces to positions of advantage from which to launch subsequent decisive operations. c. Sustaining Operations. Sustaining operations are those that assist the shaping and decisive operations by assuring freedom of action and continuity of operations, combat service support (CSS), and command and control (C2). Sustaining operations include CSS, sustainment base security and maintenance, movement control, terrain management, infrastructure development, and rear area and base security (line of communication [LOC] protection and headquarters protection). Sustaining operations are inseparable from decisive and shaping operations, although they are not by themselves decisive or shaping. 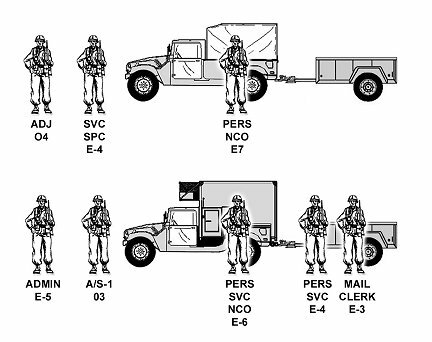 Sustaining operations occur throughout the area of operations and not only within a designated rear area. Failure to sustain normally results in failure of the overall effort. Sustaining operations underwrite the tempo of the overall operation, assuring the ability to take advantage of any opportunity without hesitation or delay. Commanders of sustaining operations designate main and supporting efforts. While the SSC environment will typically be characterized by noncontiguous areas of operation, there will be situations, primarily MTW, where the commander must describe decisive, shaping, and sustaining operations in spatial (linear) terms and time. Traditional linear situations involve conventional combat and linear arrangement of maneuver forces. Ground forces share boundaries and orient against a similarly organized enemy force while protecting sustainment functions. In some multinational operations, the capability and doctrine of coalition or alliance partners may dictate spatial organization of the battlefield. In such situations, the commander directs and focuses operations in deep, close, and rear areas. In a noncontiguous environment, the most decisive results occur when the commander carefully designs decisive, shaping, and sustaining operations to act simultaneously in combinations against the enemy throughout the AO. a. Deep Areas. The deep area is an area designated away from the close area for the purpose of shaping enemy forces prior to their arrival in the close area. Thus, the deep area relates to the close area not only by proximity, but also in terms of time and space. The SBCT may have a "deep fight" in terms of space or time. If so, an infantry battalion would conduct close combat to shape the enemy force. Advanced information technology and modern weapons systems continue to increase the pertinence and lethality of conducting operations in a deep area. In the past, deep strikes were aimed at slowing and disrupting the advance of enemy forces. SBCT forces may engage and defeat entire formations at substantial distances from the close area via joint or organic lethal effects. This capability gives the SBCT greater depth and allows for simultaneous action. Commanders of forces operating within the deep area may designate their own close, deep, and rear areas, depending upon circumstance. b. Close Areas. The close area is that area where the commander envisions close combat taking place or being imminent. Close combat includes the activities of forces in direct support of the elements engaging in close combat, such as direct support field artillery. Within the close area, the commander synchronizes overmatching effects with the intent of using maneuver and direct supporting fires in decisive action. Within the close area, one unit will be designated the main effort, while other units are supporting efforts. Commanders of forces engaged in the close area may designate subordinate deep areas, close areas, and rear areas. c. Rear Areas. Rear areas at any echelon in a linear sense are those areas behind close areas that are normally designated for support activities. The rear area may be contiguous with combat areas or may be geographically separate from them. Operations in rear areas assure freedom of action and continuity of operations, sustainment, and C2. The SBCT normally designates a rear area, but a battalion does not. When employed in an MTW, the SBCT is a force multiplier to a division or corps because of its ability to conduct rear area security operations over a large geographic region. On the nonlinear battlefield that typifies an SSC, it is difficult to define "rear areas" spatially in a traditional sense. In essence, rear areas are those locations from which sustaining operations occur. Effective command guidance and a detailed understanding of rules of engagement (ROE) and rules of interaction (ROI) are critical to the SBCT's mission accomplishment across the spectrum of conflict. ROE are directives that explain the circumstances and limitations under which US forces initiate and continue combat engagement with forces encountered. These rules reflect the requirements of the laws of war, operational concerns, and political considerations when the operational environment shifts from peace to conflict and back to peace. ROI embody the human dimension of combat. They lay the foundation for successful relationships with the myriad of factions and individuals that play critical roles in the SBCT's operations. ROI encompass an array of interpersonal communication skills, such as persuasion and negotiation. a. Rules of engagement are always significant to the ability of commanders and soldiers to successfully accomplish the mission. They may originate in law, treaty, or settlement terms and commanders' guidance. They are closely related to force protection. While they vary considerably between missions, ROE always allow soldiers to protect themselves from deadly threats. The SBCT's operations incorporate ROE throughout the full spectrum of military operations (offensive, defensive, stability, and support). (1) Numerous legal issues require close coordination with the brigade operational law team (BOLT). The ROE must consider these legal issues; they must be worded in a simple, easy-to-understand manner. Broad limitations may consist of restrictions on aviation operations at particular times and in specified areas, prohibitions on crossing political boundaries, and requirements to refrain from apprehending or limiting the movement of designated groups or individuals. (2) On the other hand, ROE commonly rule out the use of some weapons and may impose special limitations, such as the requirements for warning shots and single shot engagements. The SBCT's sniper elements provide this capability. SBCT soldiers must be trained to interpret and apply the ROE effectively in all full-spectrum operations. It is imperative that everyone understand the ROE thoroughly since small-unit leaders and individual soldiers must make politically-critical ROE decisions promptly and independently. ABCS tools support effective distribution of ROE and can assist commanders in confirming conditions that the ROE identify as threatening or innocuous. b. Rules of interaction are directives that govern the SBCT soldiers' interaction with civilians. ROI lay the foundation for successful relationships with the many factions and individuals that play key roles throughout the SBCT's AO. ROI, like ROE, will be common to all SBCT operations throughout the full spectrum of operations. (1) ROI are tools (both limiting and permissive) that enable the soldier to deal with the nontraditional situations that will be prevalent throughout MTW, SSC, and PME. ROI enhance the soldier's ability to survive in uncertain situations by giving him a clearly defined set of parameters on interaction. Simultaneously, ROI serve to aid the SBCT in mission accomplishment by ensuring even-handed interaction with civilians throughout the AO. (2) ROI are linked to ROE for each particular operation. ROI will likely come from the higher headquarters and can be made more, but not less, restrictive by the SBCT. ROI must be tailored to the specific region, culture(s), and or populations affected by the operation. Like ROE, ROI can be effective only if they are thoroughly rehearsed and understood by every member of the SBCT. As a full-spectrum combat force, the SBCT organization allows commanders to scale their force to accept like-type forces such as additional infantry or intelligence organizations. 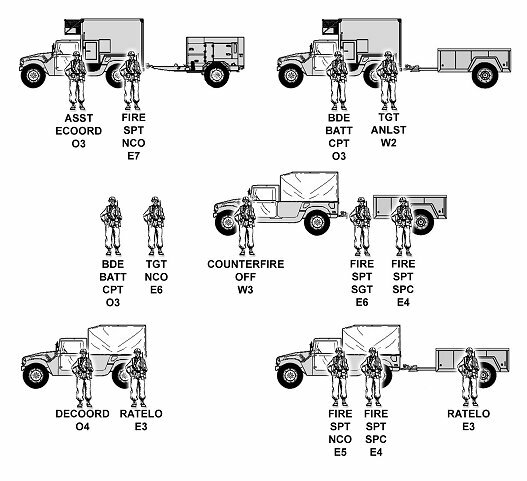 The SBCT commander can also accept augmentation of units or elements that are not organic to the SBCT structure such as lift and or attack aviation, armor, rocket artillery, air defense, military police, civil affairs, psychological operations, combat and construction engineers, and additional command and control systems assets with requisite CSS support for each system. The ability to scale his force also allows a commander to deploy without all of his organic assets or, once deployed, to use only the combat power required by mission analysis. For example, the SBCT commander may decide to attack without his vehicles. This organizational flexibility allows the SBCT to function in its primary role as the major participant in an SSC, in a MTW as part of a division or corps structure, or to serve as a "guarantor combat force" in a stability or support operation. The SBCT has an approximate personnel strength of 3,500 soldiers and is pre-configured in ready-to-fight combined arms packages. 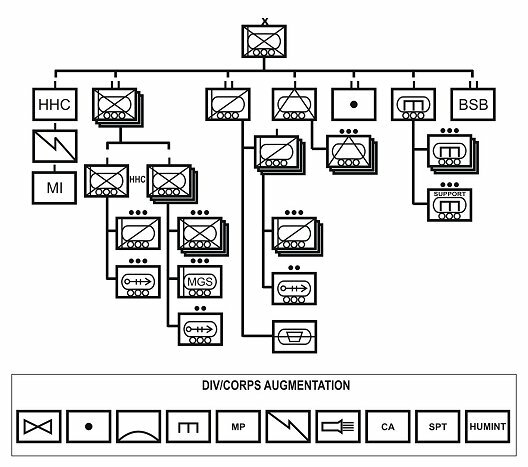 The design includes embedded unit-based capabilities such as military intelligence, signal, engineer, antitank, artillery, and CSS elements (Figure 1-4). This design allows the SBCT to fight combined arms down to company level to create combat power with flexibility in complex and urban terrain. The following paragraphs provide an overview of some key organic assets available to the SBCT. Figure 1-4. The Stryker brigade combat team. The infantry battalions (Figure 1-5) serve as the primary maneuver force for the brigade and are designed as a three-by-three organization of three rifle companies with three rifle platoons each. Companies fight as combined arms teams with an section of organic 81-mm mortars, an MGS platoon, and a sniper team. The infantry battalion mission is to close with and destroy or defeat enemy forces within the full spectrum of modern combat operations. The battalions are organized to maintain tactical flexibility within restricted and severely restricted terrain. All of the SBCT's INFOSYS and data collection capabilities are enabled in order to get the infantry battalions to the decisive place and time in accordance with the commander's intent. Figure 1-5. SBCT infantry battalion. 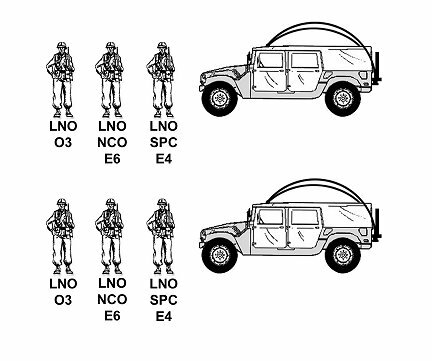 The cavalry squadron (RSTA) of the SBCT is carefully designed to provide accurate and timely information over a large operating environment (Figure 1-6). (See FM 3-20.96 for a more detailed discussion of cavalry squadron [RSTA] capabilities.) This environment is characterized by a new enemy armed with equipment advances in global weapons proliferation and unconventional terrorist and or guerilla operating tactics. The geographical area in which these enemies choose to operate is characterized by varying terrain ranging from complex urban sprawl to weak infrastructure supported by inferior roads, bridges, and transportation networks. The cavalry squadron (RSTA) provides a great deal of the information required by the commander and staff to conduct proper planning, direct operations, and visualize the future battlefield. The squadron possesses robust capabilities to successfully meet the varied and unique intelligence, surveillance, and reconnaissance challenges inherent in smaller-scale contingency operations and in major theaters of war. The cavalry squadron (RSTA) has an extensive HUMINT capability and acts as the eyes and ears of the commander. In addition, RSTA operations allow the commander to shape the battlefield, accepting or initiating combat at the time and place of his choosing. Figure 1-6. Cavalry squadron (RSTA). Figure 1-7. Field artillery battalion. Figure 1-11. Military intelligence company. Figure 1-12. Brigade support battalion. 1-26. BRIGADE HEADQUARTERS AND HEADQUARTERS COMPANY. The headquarters and headquarters company (HHC) commander works closely with and answers to the SBCT executive officer (XO) (Figure 1-13). The HHC commander is responsible for the training of assigned personnel; maintenance of organic equipment; and the support, security, and movement of the SBCT main CP and TAC CP IAW unit standing operating procedures (SOP). a. Headquarters Company. Commanded by a captain, the headquarters company provides administrative and logistical support to each headquarters section. b. Headquarters Section. The HHC headquarters section provides the personnel, equipment, and staff expertise to command and control and provides information management and communications capabilities that enable the brigade commander to plan and execute missions. The brigade commander and brigade staff reside in this section. Figure 1-13. Headquarters and headquarters company. The commander's staff must function as a single, cohesive unit. Each staff member must know his duties and responsibilities and be familiar with the duties and responsibilities of other staff members. The staff focuses on assisting the commander in mission accomplishment. The staff contributes to the commander making and executing timely decisions (Figure 1-14). Figure 1-14. SBCT staff structure. a. Brigade Commander. The commander has total responsibility and accountability for the SBCT and its actions. This includes the authority and responsibility for effectively using all available resources for planning, organizing, coordinating, and controlling all military forces in accomplishing assigned missions. He provides his subordinates with missions, resources, and a clear statement of his intent. b. Executive Officer. The executive officer directs, coordinates, supervises, and trains the staff. The XO is responsible for all staff activities, such as the development of orders. He is responsible for the operations of the main CP. The XO integrates and synchronizes combat support (CS) and CSS to support all operations. He manages the information flow within the SBCT to include the commander's critical information requirements (CCIR). Additionally, because of the XO's unique relationship with the commander, he understands the commander's intent better than, or at least as well as, the subordinate commanders. The XO is prepared to assume command of the SBCT at any time. In addition, he oversees the support and employment of separate company and smaller size CS units. c. Staff. The staff exists to assist the commander with making and implementing decisions. The staff aids the commander with recognizing and anticipating battlefield events so he can make better decisions and act on those decisions faster than the enemy can act. Once a decision is made, the commander depends on his staff to communicate his decision to subordinates, synchronize and coordinate supporting actions, and supervise execution to ensure his decision is carried out according to his intent. The staff structure of an SBCT consists of a personal staff group, coordinating staff group, and special staff group. The commander organizes his staff within a command group, TAC CP, main command post (main CP), and SBCT support area (brigade support area [BSA] CP) in order to plan, prepare for, and execute combat operations. Staff duties, functions, and procedures are defined in FM 101-5. The following provides a description of the key responsibilities of staff officers during combat operations. a. Personal Staff. Personal staff members work under the commander's immediate control and directly assist him in the exercise of command (Figure 1-15). The commander establishes guidelines or gives specific guidance when a personal staff officer should inform or coordinate with the XO or other members of the staff. (1) Command Sergeant Major. Primarily, the command sergeant major (CSM) advises the commander on all matters concerning the enlisted soldiers of the SBCT. He enforces established policies and standards concerning enlisted personnel performance and conduct and mission preparations of the SBCT. He performs other duties that the commander prescribes, to include receiving and orienting newly assigned enlisted personnel and helping to inspect command activities. He monitors the morale and discipline of the SBCT and recommends actions, as necessary. The CSM focuses his attention on functions critical to the success of the operation. (2) Chaplain. The chaplain serves as a confidential advisor to the commander on the spiritual fitness and the ethical and moral health of the command. The chaplain exercises staff supervision and technical control for religious support throughout the SBCT's area of operations. He is responsible for the development, implementation, and coordination of religious support assets, operations, and activities. He provides and coordinates privileged and sensitive personal counseling and pastoral care to the unit's command, soldiers, authorized civilians, and families. 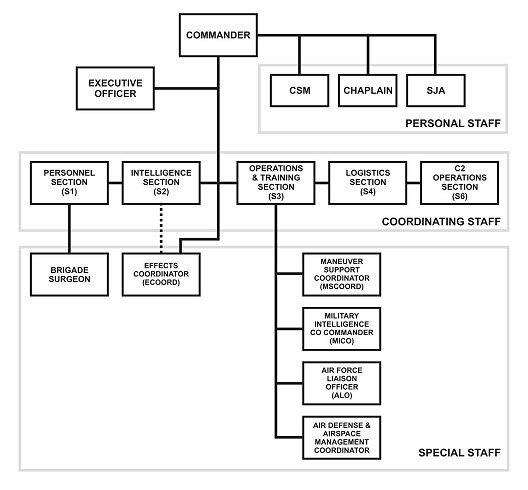 (a) The unit ministry team (UMT) is composed of a chaplain and one enlisted chaplain assistant (Figure 1-16). The UMT facilitates and coordinates religious support across the AO. The UMT advises the commander on humanitarian aspects and the impact of command policies on indigenous religions. It locates where it can best coordinate, communicate, and facilitate religious support. (b) The chaplain assistant is an active member of the unit's noncommissioned officer (NCO) support channel for religious support issues and soldier welfare. He assesses interpersonal and spiritual well being that can affect unit morale. Figure 1-16. Unit ministry team. (3) Staff Judge Advocate. The SBCT staff judge advocate (SJA) is an assigned brigade legal advisor who serves under the technical supervision of the division staff judge advocate as a brigade personal and special staff officer. The SBCT SJA is also the chief of the brigade operational law team located in the fires and effects coordination cell (FECC) information operations (IO) section. The BOLT functions as part of the FECC and as the SBCT's legal team.) The SBCT SJA provides operational law advice to the commander. He also provides legal advice during the military decision-making process regarding ROE, targeting, and other legal aspects of operations. Additionally, the SBCT SJA provides legal advice regarding international law and the law of war, and either provides or coordinates legal services in military justice, administrative and civil law, contract and fiscal law, claims, and legal assistance. 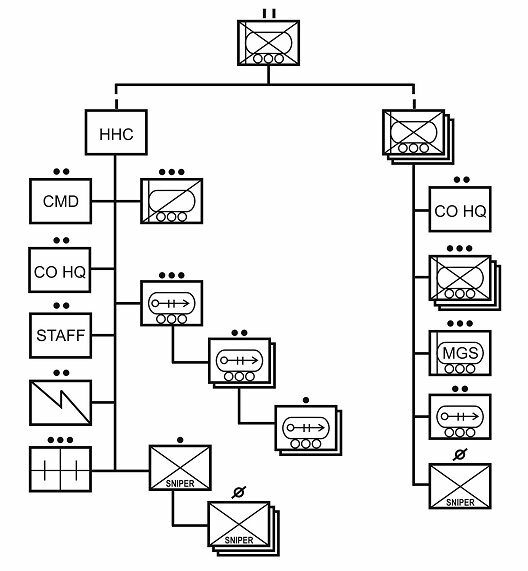 The BOLT consists of the SBCT SJA and the legal NCO and is co-located in the FECC IO section (Figure 1-17). Figure 1-17. Brigade operational legal team. b. Coordinating Staff. Coordinating staff members have primary staff responsibility for one or more broad fields of interest and are the commander's principal staff assistants (Figure 1-18). Monitoring and analyzing personnel strength and projecting future personnel requirements. Requesting, receiving, processing, and delivering replacement personnel. Planning and supervising morale support activities, postal services, awards, and administration of discipline. Providing personnel service support including finance and legal services. Coordinating the IPB for staff planning, decision making, and targeting. Coordinating with the entire staff and recommending PIR for the CCIR. As the brigade collection manager, nominating collection taskings for all the SBCT's collection assets to the S3. Supporting planning for reconnaissance and surveillance operations in coordination with the XO, S3, cavalry squadron (RSTA) commander, and MICO commander. Providing all-source intelligence that answers the PIR. Maintaining the current situation regarding enemy and environmental factors and updating IPB and the intelligence estimate. Identifying and evaluating intelligence collection capabilities as they affect the AO security, counter-surveillance, signal security, security operations, and force protection. The S2x is the intelligence staff officer for HUMINT and CI activities. The S2x provides focus and technical support for all CI and HUMINT activities. He ensures the collection, analysis, and dissemination of HUMINT and CI-related intelligence and information is in concert with the commander's critical information requirements. Preparing, coordinating, authenticating, publishing, and distributing the command SOP, operation orders (OPORDs), fragmentary orders (FRAGOs), warning orders (WARNOs), and other products involving contribution from other staff sections. Planning for ISR operations in coordination with the XO, S2, cavalry squadron (RSTA) commander, and MICO commander. Synchronizing tactical operations to include reviewing and coordinating subordinate plans and actions. Coordinating and directing terrain and airspace management. Recommending priorities for allocating critical command resources and support. Directly assisting the commander in controlling preparation for, and execution of, operations. Staffing, executing, and supervising operational security (OPSEC). Coordinating civil and military operations in the absence of the S5. (a) Current Operations Cell. The current operations cell monitors and controls operations throughout the SBCT AO and maintains the COP. It coordinates with higher and adjacent units, analyzes relevant information, and provides recommendations to the commander. The cell is normally manned by two battle captains (S3 and S2), the S3 sergeant major, battle staff NCOs, liaison teams, and communications personnel. The current operations cell also maintains contact with the plans cell in the rear CP. This allows it to anticipate future ISR requirements and keep the commander informed of planning being conducted beyond 24 hours. (b) Plans Cell. The future plans cell maintains a current and projected view of the situation and plans operations to be conducted beyond 24 hours based on the orders from higher headquarters, projected outcomes of the current operation, and the SBCT commander's guidance. The cell consists of two S3 plans officers and battle staff NCOs; it is augmented by the other staff sections (or cells) as required during planning. At a minimum, the cell should include representatives from the cavalry squadron (RSTA), intelligence cell (to include the S2x team), FECC, maneuver support (MANSPT) cell, and the BSB. The cell works closely with higher headquarters to enhance parallel and collaborative planning. (c) Brigade Liaison Teams. 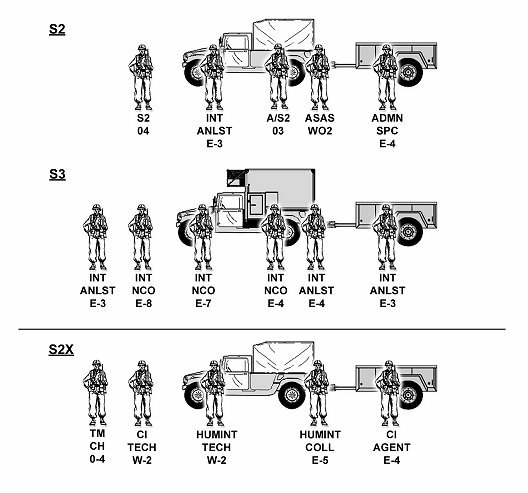 Also resident within the brigade S3 section are the brigade liaison teams (Figure 1-22). During operations and during normal daily activity, these teams provide liaison between units to help facilitate communications, preserve freedom of action, and maintain flexibility. Liaison ensures that the SBCT, along with adjacent commands, remains aware of respective tactical situations by providing them with exceptional, critical, or routine information; verification of information; and clarification of operational questions. Liaison teams also can provide a digital communications link and COP to analog units that are not equipped with a comparable ABCS capability. Recommending and coordinating locations for main supply routes (MSRs) and logistics support areas. Projecting requirements and coordinating all classes of supply, except Class VIII (medical), according to the commander's priorities. Monitoring and analyzing the equipment and logistics readiness status of the brigade. Developing and synchronizing CSS to include supply, transportation, maintenance, and services. Directing and controlling the operations of the BSB CP. Advising the commander on communications requirements. Establishing, managing, and maintaining communications links, including reach communications. Planning and coordinating network terminals. Determining system requirements needed for support based on the tactical situation. Informing the commander of primary and alternate communications capabilities. Establishing and enforcing network policies and procedures. Developing Annex H (Signal) to the OPORD. Advising the commander and other users on the requirements, capabilities, and use of the available systems. Coordinating signal interfaces with those elements not operating with ABCS. Monitoring the status of communications, to include WAN, combat net radio (CNR), near-term digital radio (NTDR), enhanced position locating reporting system (EPLRS)/TI, and global broadcast service (GBS). 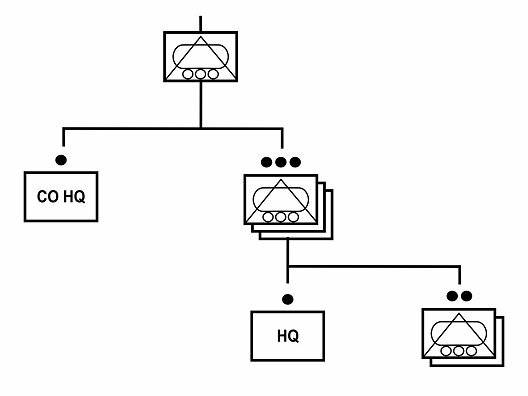 Monitoring network performance and database configuration and planning system reconfigurations caused by changes in the tactical situation, communications connectivity, and system initialization instructions. Reporting network changes to the commander. Training users on automation information systems. Training users to establish and interconnect networks. Preparing communications network security plans, instructions, and SOPs. Developing security policies and procedures for network operations. Reporting threats to network security. (1) Effects Coordinator. The field artillery battalion commander serves as the SBCT effects coordinator (ECOORD). He is responsible for all fires and effects planning and coordination for the SBCT. He advises the SBCT commander on the capabilities and employment of fires and effects and is responsible for obtaining the commander's guidance for desired effects and their purpose. The ECOORD is part of the command group and locates where he can best execute the SBCT commander's intent for fires and effects. The deputy effects coordinator (DECOORD) is the principal fire support (effects) staff planner in the SBCT main CP and works in the effects coordination cell (Figure 1-25). Figure 1-25. Fires and effects coordination cell. (2) Fires and Effects Coordination Cell. The fires and effects coordination cell coordinates all fires and effects for the SBCT and assists both the current operations and future plans cells. It serves as a liaison between the SBCT and the artillery battalion, IO, civil affairs (CA), psychological operations (PSYOP), and intelligence and electronic warfare (IEW) assets. The FECC is a product of the effects-based fires concept and is a standing organization within the SBCT headquarters. The cell works under the direction of the ECOORD (the artillery battalion commander) and consists of a fire and effects section, a targeting and counterfire (T&C) section, an IO section, and the TACP. The FECC is led and directed by the deputy effects coordinator. (a) Deputy Effects Coordinator. The DECOORD is a field artillery major that plans, coordinates, and orchestrates full-spectrum fires and effects in time, space, and purpose against high pay-off targets (HPTs) within the AO to support the SBCT commander's intent. His primary means to plan, integrate, and orchestrate fires and effects is via FECC. The DECOORD serves as the primary assistant to the effects coordinator and is the permanent full-time liaison between any direct support field artillery assets and the SBCT. He assists the SBCT S3 in integrating fires and effects into the SBCT's maneuver plan (to include reconnaissance and surveillance), and he is responsible for the development of the SBCT fire support plan. Collecting and processing battlefield information and intelligence to identify targets. Requesting and analyzing combat damage reports. Providing assessments that inform and are integrated back into the ongoing targeting process. Coordinating and controlling the employment of the SBCT target acquisition assets. Coordinating and controlling radar zone coverage for SBCT counterfire radars and any attached radars. Providing input into reconnaissance and surveillance planning and execution. Processing valid target information for supporting fires and effects assets (including IO assets) to execute in accordance with the T/ESM. (d) Air Force Liaison Officer/Tactical Air Control Party. The air liaison officer (ALO) is the senior Air Force officer of the tactical air control party (TACP) supporting the SBCT. He is responsible for supervising TACP personnel and forward air controllers (FACs) as well as coordinating tactical air (TACAIR) assets and operations for the SBCT. The TACP coordinates close air support (CAS) missions with the FECC and the SBCT S3. It also works with the air defense and airspace management (ADAM) cell to manage airspace in the SBCT's AO to include flying UAVs and deconfliction with USAF aircraft as well as aircraft from other services. 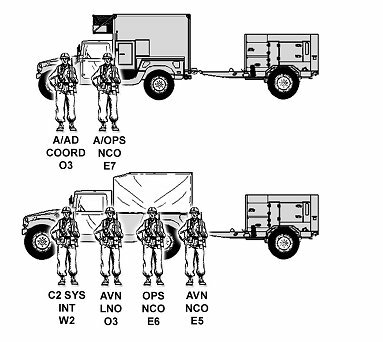 The ALO and TACP are normally located with the rear CP during planning and preparation; during execution, however, the ALO will normally locate with the command group. (e) Information Operations Coordinator. The information operations coordinator (IOCOORD) advises the SBCT commander on all information operations matters. Additionally, the IOCOORD participates in the development of IPB products and works with the fires and effects cell throughout the targeting process. The IOCOORD is a key synchronizer of the SBCT's non-lethal effects. (f) Information Operations Element. An information operations element is embedded within the FECC and consists of information operations, CA, and PSYOP personnel. The IO element plans (within a 24 hour window) and coordinates information operations and other non-lethal battlefield effects in support of the SBCT. The information operations officer coordinates, integrates, and synchronizes information operations elements. These operations include the degradation of enemy command and control, military deception, counterdeception, operations security, information assurance, computer network defense teams, and the use of counterintelligence teams. The IO element works in concert with the SBCT S3 and conducts close coordination with the S2, S6, and other SBCT staff elements as necessary. The IO element is the principal staff element for all matters concerning civil-military operations (the civilian impact on military operations and the impact of military operations on the civilian populace). The IO officer supervises the efforts of augmentation elements such as PSYOP detachments, CA teams, electronic attack teams, special IO teams, and public affairs teams. The IO element may request support for specific functions from higher headquarters. Such functions may include electronic warfare, computer network attack, special information operations, psychological operations, and counterpropaganda (including public affairs and civil affairs) based on METT-TC considerations. The IO element integrates and synchronizes these augmentation assets with reconnaissance and surveillance operations and the maneuver plan. (3) Maneuver Support Coordinator. The senior maneuver support officer in the maneuver support cell serves as the principal maneuver support planner in the SBCT main CP. He ensures that coordination is conducted with echelons above division (EAD) engineers and military police and is responsible to the brigade commander for all maneuver support efforts and requirements within the AO. (4) Maneuver Support Cell. The MANSPT cell is responsible for planning, integrating, and synchronizing mobility and or survivability and military police (MP) support for all operations (Figure 1-26). (a) The senior MP planning officer within the MANSPT cell serves as the SBCT MP and is responsible for MP planning, coordination, and synchronization of MP maneuver elements. He serves as the principal advisor to the SBCT commander on matters relating to MP support. He recommends the allocation of resources, tasks, and priority of support. He performs OPCON of any MP assets provided to the SBCT and supervises the execution of any MP missions. Dependent upon METT-TC, the SBCT could receive support ranging from platoon- to company-size units from a division or corps. During offensive operations, MPs best support the brigade's maneuver and mobility by facilitating movement control and refugee, casualty, and or enemy prisoner of war (EPW) evacuation and control. In the defense, MPs are best employed in the area security role to enhance the SBCT's maneuver and mobility. The MP planner, as part of the MANSPT cell, provides for the synchronization and weighting of the MP effort in support of the SBCT's main effort just as any other asset. (b) The MANSPT cell also assists the SBCT staff with developing engineer plans to include engineer task organization, scheme of engineer operations, and obstacle plans. The senior engineer officer serves as SBCT engineer and is responsible for engineer planning and coordination. 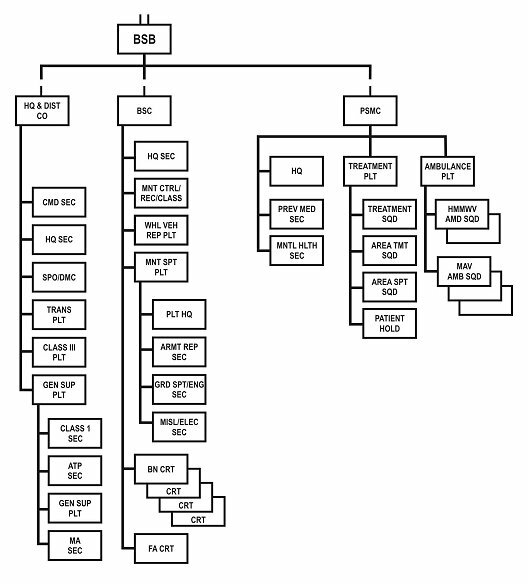 It coordinates all military and civilian engineer efforts within the SBCT's AO and controls engineer assets and units not task organized to the SBCT's subordinate units. (c) The MANSPT cell also supports the SBCT with terrain analysis products. The digital topographic support (DTS) team provides 24-hour digital terrain data production support and analysis using the digital topographic support system (DTSS). Figure 1-26. Maneuver support cell. (5) Air Defense and Air Space Management Cell Coordinator. The senior air and missile defense (AMD) officer within the ADAM cell is the primary air defense and airspace management advisor to the SBCT commander. He coordinates with the SBCT AMD units and divisional and corps staff on all Army airspace command and control (A2C2) aspects. (6) Air Defense and Airspace Management Cell. 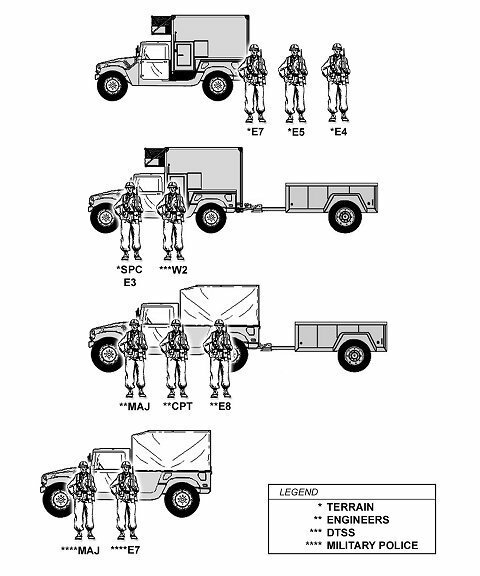 Air defense and aviation personnel man the ADAM cell (Figure 1-27). They provide the commander and staff with special area expertise operating out of either the main or rear CP. 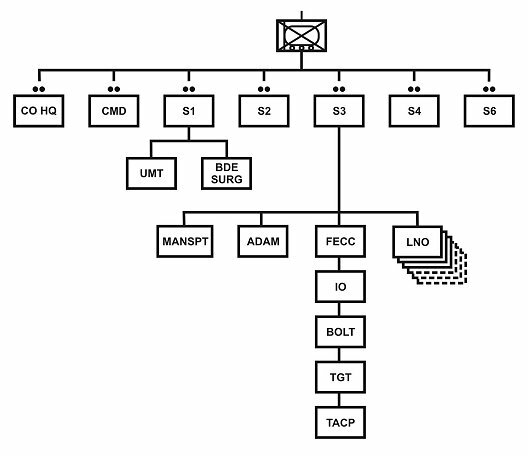 The ADAM cell is responsible for planning, coordinating, integrating, and controlling air defense and airspace management for the SBCT, to include developing air defense plans, air defense artillery (ADA) task organization, scheme of air defense operations, and reconnaissance and surveillance planning. 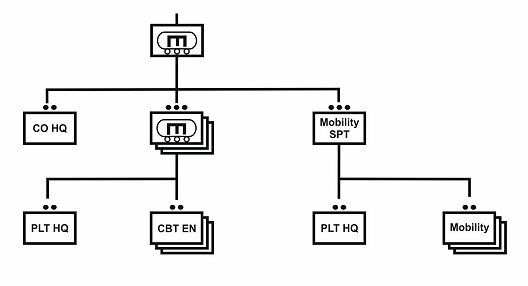 This cell also provides control over any ADA assets and units not directly task organized to the SBCT's subordinate units. The ADAM cell also coordinates aviation operations in support of the SBCT, providing the commander with synchronization and control of aviation operations. The ADAM cell assists the staff with these duties, to include A2C2 of UAV operations, airspace management, tactical employment of aviation assets, and positioning of forward arming and refueling points (FARPs). Figure 1-27. Air defense and airspace management cell. (6) Military Intelligence Company Commander. The MICO commander responds to the tasking of the SBCT commander. He organizes for combat based on the mission, scheme of support, task organization, and specified and implied tasks contained in the SBCT's order. The MICO commander uses the order to plan, prepare, execute, and assess the MICO's operations. 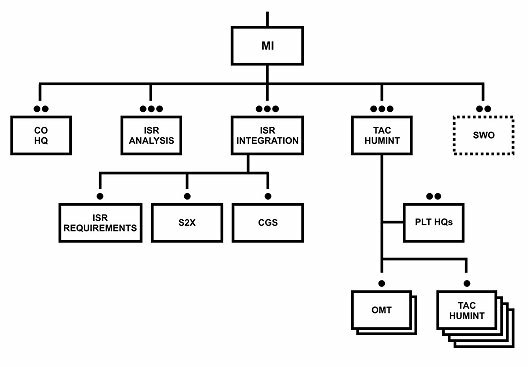 Normally, the ISR analysis and ISR integration platoons are OPCON to the SBCT S2 while providing analysis and intelligence production capabilities to the S2 and ISR tasking and visualization capabilities to the commander, S3, and S2 in support of SBCT operations. The MICO's tactical HUMINT platoon remains under the command and control of the MICO commander and provides general support (GS) to the SBCT or DS to subordinate elements of the SBCT, dependent on an analysis of the factors of METT-TC. The MICO commander advises the S2 and the SBCT commander on the proper utilization of MICO ISR assets and the proper utilization of any ISR assets attached to the SBCT that are not specifically attached to other SBCT subordinate elements. The MICO commander assists the SBCT S3 and S2, the ECOORD, and the cavalry squadron (RSTA) commander with planning and conducting C2-protect and C2-attack operations. The MICO CP normally locates with or near the SBCT main CP. (7) Brigade Support Battalion Commander. The BSB commander is also considered a special staff officer. He advises the SBCT commander on all combat service support matters. Due to the austere CSS structure of the battalions within the SBCT, the BSB commander plays a significant role in sustaining the combat effectiveness of the SBCT as a whole. He commands and controls the BSB to provide the SBCT with essential CSS functions. The BSB commander exercises OPCON over CSS units operating in the brigade support area. The BSB commander's support operations officer serves as the focal point for all logistics support to the SBCT. The support operations officer's primary role is to coordinate, synchronize, and supervise execution of direct logistic support (all classes of supply, maintenance, medical, transportation, and field services) for the SBCT and divisional and or corps units operating within the SBCT AO. The BSB support operations officer and the SBCT S4 work closely in planning and synchronizing CSS. (8) SBCT Surgeon. The SBCT surgeon is responsible for the technical control of all medical activities in the command. The brigade surgeon oversees and coordinates HSS activities through the brigade surgeon's section (BSS) and the brigade staff (Figure 1-28). He keeps the brigade commander informed on the status of HSS for brigade operations and on the health of the command. The brigade surgeon and his staff are located within the brigade main tactical operations center (TOC) where they work with the brigade S3 to develop the HSS input to the brigade OPORD and operation plan (OPLAN). For additional information on the BSS (digitized), refer to FM 4-02.21. Figure 1-28. SBCT surgeon section. Developing HSS staff estimates for supporting brigade operations. Developing and coordinating the medical brigade HSS plan with the brigade staff, forward support battalion (FSB), forward support medical company (FSMC), and maneuver battalion medical platoons. Developing the HSS annex of the brigade OPLAN and OPORD. Coordinating through higher headquarters for corps medical support reinforcement and or augmentation, as required. Verifying emergency supply requests and taking the necessary action to expedite delivery. Monitoring Class VIII resupply levels to ensure adequate stockage for support of brigade operations.